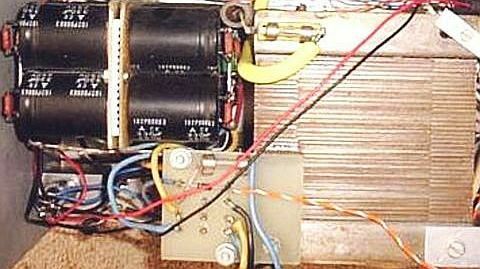 At present it is not so easy to obtain correct high-voltage transformers. 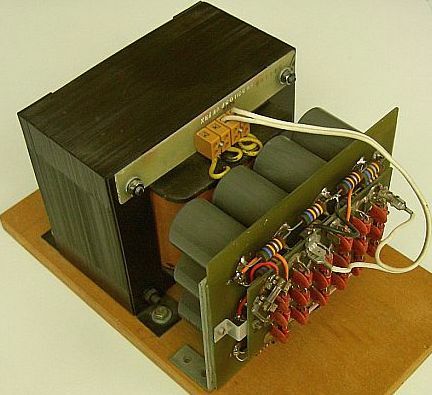 Using a high-power isolation-transformer that must be of suitable rating to handle the wattage and heavy current involved in the following circuit solves the problem here. With a doubling or quadrupling circuit (fig»), adequate high voltage can be delivered. Series-connected modern electrolytic with large capacity and high voltage (e.g. 470 μF/400 V) will give adequate smoothing and regulation during modulation peaks. 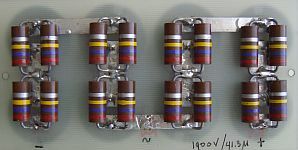 They should be individually bridged by an equalising resistance of 100 kΩ (2 W). For safety reasons and adequate cooling, it is better to have two 220 kΩ or three 330 kΩ resistors in parallel instead of one of 100 kΩ. The special feature of this arrangement is that by means of two manually-operated switches, the unit provides rectification, doubling and quadrupling of the AC-voltage delivered from a 1 : 1 mains isolating transformer. Shown here is a circuit with only 6 capacitors, 6 diodes and 2 switches. I have not seen this particular arrangement published previously, so I presume that I am the originator of this type of flexible PSU. If you don't like the feature of adjusting with lowered voltage (soft-start, which prevents problems), the switches may be left out and the appropriate connections be made. The average voltage after quadrupling will be around 1150 V during SSB-transmission and around 1000 V with a constant carrier. There is no soft-start delay in the power-supply as I presumed that the two switches and the internal resistance in the transformer suffice to limit the inrush current. Almost every year reducing in size. Electrolytic cap types (range 220 µF/400 V to 470 uF/450 V) for switched power supplies are suitable for this design. They should have their dielectric reformed first, when they have not been used for a long time. This also holds for new ones, as the date of manufacture is seldom known. Reforming is done with a 200 – 300 V supply by charging the individual electrolytic through a 20 – 50 kΩ/10 W resistor. If the leakage current and voltage are stabilised (may take minutes), the supply voltage can be raised to the intended working voltage, which should be lower than the rated one. This reforming stage can be used for testing and selecting overages electrolytic. After testing, the electrolytic should be discharged with a resistor. Normally, I use a 25 Ω/10 W resistor.